Carter Blake is a man who knows how to find people who don’t want to be found. Blake himself is one of those men. His real name is in the past, his home is a succession of comfortable, anonymous hotels, and those whose lives he touches feel relieved when they are free of him. Blake is for hire, a man who skirts the law in order to trap the guilty. When the Chicago Sniper, Caleb Wardell, escapes on his way to Death Row, the FBI call on Blake to work ‘with’ its team of agents to capture this monster before he does too much of what he likes best – putting a single death shot in the head, throat or chest of those he chooses to murder. The FBI isn’t aware of how good the choice of Blake actually is. It turns out Blake has met Wardell before, during a time when Wardell was paid to kill. Blake is paired with Elaine Banner, an ambitious agent, initially hostile to the idea of an outsider intruding on the investigation, but, as the number of bodies rises, mostly victims selected for no other reason than whimsy, the two learn to work together to find this coldest of killers. It’s quite a chase. It takes them across hundreds of miles of ominously empty American countryside and alarmingly crowded city squares and gardens. But it’s cat and mouse games. Wardell is no fool. He has his pursuers within his sights. It could all come down to chance. 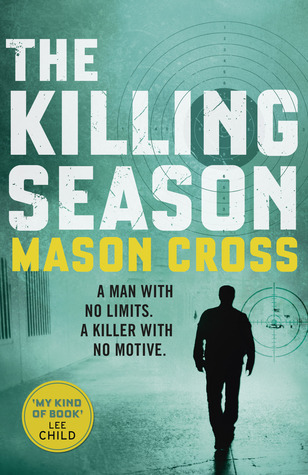 The Killing Season introduces Carter Blake but it takes no time at all for us to feel in safe hands. From the very first chapter, with the edge-of-seat escape of Wardell, just two weeks from a lethal injection, Mason Cross demonstrates that he, and Blake, means business. The narrative is divided in two with much of it provided by Blake himself in the first person. The rest is told in the third person, following the FBI investigation while also keeping close to Wardell himself. This split technique is used very effectively. Blake drops small hints about his past, reveals types of behaviour, all helping us to get to know Blake as much as we can, far more than the FBI agents do, while we’re also given insight into the thoughts and motives of such opposite characters as Wardell and Elaine Banner. We warm to Elaine. We do no such thing for Wardell. The psychological drama is matched by action. The Killing Season is a very exciting novel indeed, made extra tense by the mystery surrounding both prey and hunter. We move across locations, each vividly described, meeting potential victims and suspects, tripping over red herrings, getting sidetracked by false alarms. And then there are the twists. This is a very clever novel. It’s not going to be easy for Blake. The Killing Season intrigued me when I first heard of it. An American serial killer/FBI agent thriller written by an author who isn’t American (Scottish, in this case). But, as far as I’m concerned, Mason Cross has pulled it off and should be congratulated. I have the next of his adventures at hand, The Samaritan, and I’m looking forward to it enormously. Mason Cross has created a new, nameless, fascinating hero who has a great future ahead of him. This entry was posted in Crime, Review, Thriller and tagged Crime, Crime catch up, Thriller on May 15, 2015 by Kate (For Winter Nights). I’ve got this and wasn’t sure if it was for me – thought it sounded like a Jack Reacher-type novel. Sounds like you really enjoyed it though, so I’ll definitely be giving it a bash (not that there’s anything wrong with Jack Teacher, I hasten to add – but you only need one, don’t you?!) Enjoyed your review, Kate, thanks!